The Career Exploration Series is a program of panel discussions, seminars and networking events that aim to educate postdoctoral trainees about the wide range of careers open to them following their training. Events are open to everyone unless otherwise stated below. Questions? Contact Andrew Cusick (acusick@wisc.edu). Wednesday April 10, 2019 12:00pm-1:30pm. Auditorium, 1111 Genetics-Biotechnology Center. Panel discussion followed by informal networking with lunch. The ups and downs, but mostly ups, of working for smaller biotech and pharma companies. Panelists will discuss their experiences transitioning from academia to smaller, independent biotech companies. Is small biotech right for you and which attributes do they want? Sponsored by the Wisconsin Section of the American Chemical Society (ACS). Questions about the event should be directed to Andrew Cusick, Career Development Officer (acusick@wisc.edu). This event was not recorded. Wednesday June 27, 2018 12:00pm-1:30pm. Auditorium, 1111 Genetics-Biotechnology Center. Your proven ability to use quantitative research skills to address important questions makes you highly competitive for jobs in a wide variety of employment sectors. Business, government, and non-profits need your research insight to solve critical problems. Come hear from physical science and engineering PhDs who are using their training to pursue careers in research and development, data services, and product management. Wednesday June 13, 2018 12:00pm-1:30pm. Auditorium, 1111 Genetics-Biotechnology Center. Do you plan to pursue a faculty position? This informal question and answer session is an opportunity to hear the perspectives of postdocs from UW–Madison who have successfully navigated the job market this year, before they leave to start their new positions. Discussion topics will include: application materials, phone interviews, campus visits, negotiations, and managing the two-body problem. Wednesday January 24 12:00 pm-1:30 pm. 6201 Microbial Sciences. Your proven ability to use quantitative and qualitative research skills to address important questions makes you highly competitive for jobs in a wide variety of employment sectors. Business, government and non-profits need your research insight to solve critical problems. Come hear from social science PhDs who are using their training to pursue careers in software development, healthcare, consulting, and public policy research. Monday November 6 9:00am-2:00pm. Catalent Biologics, Madison. Are you considering using your scientific expertise in the pharmaceutical industry? This event is a great opportunity to interact with industry scientists, tour their facility, and understand how your skills and experience match different roles within their company. Catalent Pharma Solutions, a leading advanced delivery technology company, helps pharmaceutical, biotech and consumer health innovators develop and supply superior products that improve people’s lives. The Madison office is the center for biologics excellence where they produce protein and nucleic acid based therapeutics for unmet medical needs. Within their facility, project managers coordinate the efforts of their molecular biologists, cell line developers, upstream and downstream process development scientists, and bioanalytical chemists as they develop robust processes that their GMP bio-manufacturing, quality control and quality assurance teams use to produce new therapeutic treatments for use in clinical studies. Wednesday September 20 11:30am-1:00pm. 1220 Health Sciences Learning Center. Is your “elevator pitch” ready for use at job interviews and conferences? Join serial entrepreneur Chris Kendrick-Parker, and Brian Jarecki (Technical Sales Consultant, Essen Bioscience) for a demonstration of this method of starting professional conversations, and receive detailed guidance on crafting and delivering your own elevator pitch. Following the workshop, try out your pitch to start mutually beneficial conversations with participants from Promega, Essen Bioscience, and UW-Madison who have come together as part of a campus research symposium. Monday May 22, 2017 12:00pm-1:00pm. 1360 Genetics-Biotechnology Center. Do you plan to pursue a faculty position? This informal question and answer session is an opportunity to hear the perspectives of postdocs and scientists from UW–Madison who have successfully navigated the job market this year, before they leave to start their new positions. While the panelists perform research in the social sciences, much of their experiences are relevant to all fields. Discussion topics will include: application materials, phone interviews, campus visits, negotiations, and managing the two-body problem. Thursday May 18, 2017. 12:00pm-1:00pm. Auditorium, 1111 Genetics-Biotechnology Center. Management consulting firms routinely hire problem solvers with advanced degrees from a wide range of disciplines to solve their clients' business challenges. Individuals with proven quantitative analytical skills are especially in demand. Firms seek applicants with a drive to succeed, and will provide intense on the job business and management training for their new hires. Senior Consultant, Navigant. Previously at Simon-Kucher & Partners. Co-sponsored by The University of Chicago's UChicagoGRAD. Video recording of the event here. Thursday April 20, 2017. 1:00pm - 2:00pm. 1220 Health Sciences Learning Center. 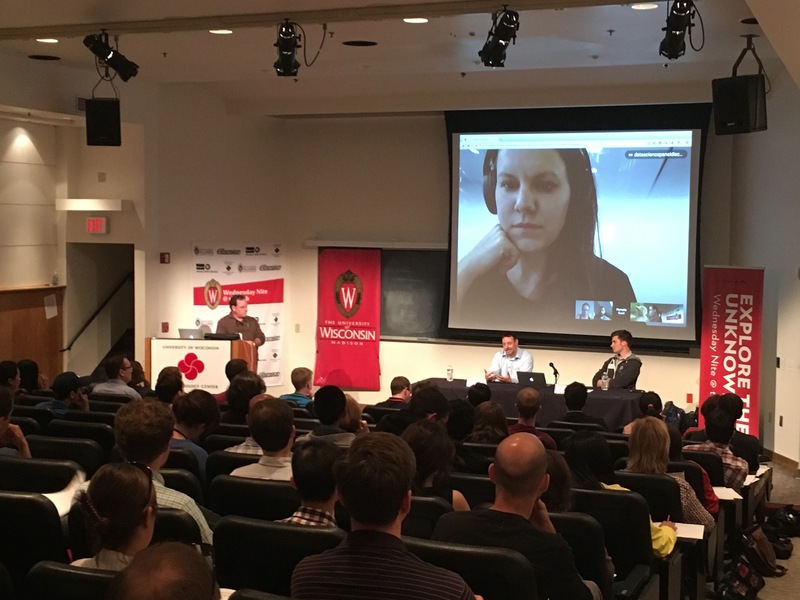 As part of an all day Gene Editing Symposium at the University of Wisconsin co-sponsored by TaKaRa Bio, the UW-Madison Office of Postdoctoral Studies is pleased to host a "Breaking into Industry" panel. Join two product managers, a consultant, and an operations vice president from four different biotech companies to see if industry is the right place for you. Panelists will share their experiences and what led them to a career in industry. Co-sponsored by the Office of Corporate Relations. Friday April 7, 2017. 1220 Biochemical Sciences. 12:00pm - 1:00pm Informal Q&A with speaker. Join us for an informal discussion about careers in science writing and science journalism with Science Journalist, Eric Vance. After working as a scientist on research projects dealing with dolphin intelligence and coastal ecology, he became an educator and then an environmental consultant. In 2005, he attended UC Santa Cruz’s famed science communication program and discovered a passion for journalism. Vance's work focuses on the human element of science – the people who do it, those who benefit from it, and those who do not. He has written for The New York Times, Nature, Scientific American, Harper’s, National Geographic, and a number of other local and national outlets. Discussion topics will be driven by your questions, but we plan to at least discuss why he decided to be a science writer, what he does, and his advice for postdocs who want to successfully pursue a career in his field. Monday April 3, 2017. Auditorium, 1111 Genetics-Biotechnology Center. 12:00pm-1:00pm Panel Discussion. 1:00pm - 1:30pm Reception and Q&A. Are you looking for a position in the biotechnology or pharmaceutical industry? Come learn about local and multinational companies from current employees. Companies include Takeda Pharmaceuticals U.S.A. Inc. (TPUSA), Invenra Inc., and Arrowhead Pharmaceuticals, Inc.
Bryan Glaser, PhD, Head of Research, Invenra, Inc.
Michael Lawler, PhD, Group Leader, Arrowhead Pharmaceuticals, Inc.
Stacey Melquist, PhD, Senior Scientist, Arrowhead Pharmaceuticals, Inc.
Co-sponsored by the Molecular and Cellular Pharmacology Graduate Training Program and the Graduate School Office of Professional Development. Tuesday March 28, 2017. Auditorium, 1111 Genetics-Biotechnology Center. 12:30pm-1:30pm Panel discussion. 1:30pm-2:30pm Q&A for postdocs. Many researchers with PhDs pursue fulfilling careers in state and federal government agencies. The mission of government agencies is distinct from academic institutions and the role of their researchers can therefore be different. Come learn how researchers in government agencies use their academic training to contribute to public policy, protect valuable resources, and help solve complex problems of national and regional importance. Video recording of the event available here. Wednesday March 1, 2017. 12:30pm-1:30pm. Auditorium, 1111 Genetics-Biotechnology Center. PhDs in many disciplines are competitive for positions at independent college-preparatory schools. Compared with the tenure-track job market, applicants can be more geographically selective and relocate from one high school to another more easily. These institutions allow teachers a great deal of curricular and pedagogical autonomy, the opportunity to build close relationships with students and pursue extracurricular interests, and unrestricted summer breaks to use to continue academic research or augment one’s income. Co-sponsored by the Department of History and the Graduate School Office of Professional Development. Wednesday February 2, 2017. 12:00pm-1:30pm. 8411 Sewell Social Sciences Building. PhDs have a wide range of careers open to them in government, the non-profit sector, and private industry, as well as higher education. Hear from Sociology alumni who will shed light on the way they employ their training as social scientists, and discuss what they find engaging and rewarding about their work. Co-sponsored by the Department of Sociology, the Department of Community and Environmental Sociology, and the Graduate School Office of Professional Development. The recording of this event is not available. Tuesday January 24, 2017. Auditorium, 1111 Genetics-Biotechnology Center. Do you privately worry that a job as a professor at a research-intensive institution is out of reach? In today’s fiercely competitive academic job market, it is important to know if you are ready to search for a position and if you will be competitive. A range of perspectives will be provided from senior faculty who have served on search committees, as well as a recently hired assistant professor. They will candidly discuss what it takes to secure a position and how you can accurately assess your own competitiveness. Thursday November 17, 2016. Auditorium, 1111 Genetics-Biotechnology Center. 12:00pm-1:00pm Panel discussion. 1:00pm-2:00pm Q&A for postdocs. Do you love research but know you don't want to pursue the faculty track? A career as a staff scientist might be the right fit for you at a university or research institute. Researchers seeking these positions should be aware of many nuances in this career path. We invite you to make an informed career decision by hearing from a panel of staff scientists and the Secretary of the Academic Staff, who serves as a resource for them. Thursday October 20, 2016. Auditorium, 1111 Genetics-Biotechnology Center. 12:00pm - 1:00pm Panel Discussion. 1:00pm - 2:00pm Q&A Session for Postdocs. Thursday October 6, 2016. 1360 Genetics-Biotechnology Center. 10:00am - 11:00am Informal Q&A with speaker. Join us for an informal discussion about careers in science writing and science journalism with UW-Madison Science Writer in Residence Nadia Drake. Drake holds a doctorate in genetics from Cornell and is a graduate of the University of California, Santa Cruz’s science writing program. She has contributed to numerous publications and venues, including Nature, Wired Science and Science News. She is a contributing writer for “No Place Like Home,” a blog with National Geographic’s Phenomena science salon. Discussion topics will be driven by your questions, but we plan to at least discuss why she decided to be a science writer, what she does and her advice for postdocs who want to successfully pursue a career in her field. Thursday September 29, 2016. 1360 Genetics-Biotechnology Center. Have you come to love working in higher education but are not sure you want to become a professor? The truth is, most Ph.D level employees at universities have diverse and rewarding careers beyond the professoriate. Join us for a Career Exploration panel in which we will share the experiences of individuals who have held posts at top universities as deans, program directors, registrars, science editors, and in student development. Tuesday June 7, 2016. Auditorium, 1111 Genetics-Biotechnology Center. 12:00pm-1:15pm Panel Discussion. 1:15pm-2:00pm Q&A Session for Postdocs. In the last 5 years, high performance computing, once expensive and available only to those who could afford the physical gear, has become exponentially cheaper and easily accessible via the cloud. This recent development, combined with the constant demand for organizations to become ever more efficient has led to the booming interdisciplinary field, of data science. But what is data science and what does a data scientist actually do? Our panel of PhDs from physics, math, psychology and neuroscience will discuss this new career. Thursday April 28, 2016. Auditorium, 1111 Genetics-Biotechnology Center. 4:30pm-5:30pm Panel Discussion. 5:30pm-6:30pm Q&A Session for Postdocs. Friday April 1, 2016. 1220 Biochemical Sciences. 12:00pm-1:00pm Presentation. 1:00pm-2:00pm Q&A Session. Colonel Robert Casillas, PhD, an accomplished scientist, highly decorated officer and successful businessperson began his career as a Bravo 71 Research Biochemist in the U.S. Army after completing a postdoc at Vanderbilt University. His academic expertise combined with military experience has led him to be an influential advisor on chemical, biological, radiological and nuclear medical defense. In his current roles in the Army Reserves and as a Vice President at the defense contractor MRIGlobal, Casillas has advised top-level personnel in the military, the private sector, civilian government agencies, intelligence agencies and the White House. Come listen to an engaging talk in which Colonel Casillas describes how the U.S. Army was fertile ground for a multifaceted and rewarding career. Monday February 8, 2016. Auditorium, 1111 Genetics-Biotechnology Center. 12:00pm-1:00pm Panel discussion. 1:00pm-2:00pm Q&A Session for Postdocs. What career options are there for PhD scientists and engineers in industry? The following panel of representatives from one company, Exact Sciences, will describe the breadth of jobs available. 3:00pm-4:00pm Company introductions. 1345 Health Sciences Learning Center. 4:00pm-5:00pm Networking. Atrium, Health Sciences Learning Center. Are you looking for a career in Biotechnology? Come join us for this networking event! Learn about Madison’s Biotech companies; who they are and what they specialize in. This is an opportunity to start connecting with research scientists, project managers, research and development group leaders, patent law attorneys, and other UW alumni in a causal networking setting. Co-sponsored by the Cellular and Molecular Biology Graduate Program, the Molecular and Cellular Pharmacology Graduate Training Program, and the Neuroscience Training Program. Friday September 11, 2015. Auditorium, 1111 Genetics-Biotechnology Center. 11:30am-12:30pm Panel discussion. 12:30pm-1:30pm Q&A Session for Postdocs. Tuesday August 25, 2015. Auditorium, 1111 Genetics-Biotechnology Center. 9:30am-10:30am Presentation. 10:30am-11:30am Q&A Session for Postdocs. The number of job opportunities for PhDs in Biotech and Pharma dwarfs the academic job market. Are you aware of these opportunities, and more importantly, of the differences between academic research and drug development? Doug Kalish, PhD, entrepreneur and educator, will describe the drug development process and enumerate the roles that PhDs can play. He’ll also detail the realities of working in a non-academic environment and introduce you to the different types of business cultures you will encounter. Finally, he’ll focus on what life is like at a biotech startup – the good, the bad, and the ugly. This seminar will help you make the decision to pursue a pharma or biotech career and give you vital insights into how the industry works.